We’ve added some new categories to the Insurance Choice Awards this year to better reflect the changing face of the insurance industry in 2017. As well as the insurance “Innovation of the Year”, we’re taking a look at which insurers are meeting the growing demand for great mobile apps by helping to crown a “Best Insurance App”. It's no secret that the race to create the best banking app is red-hot (we crowned NatWest the winner of "Best Banking App" in our British Bank Awards 2017)...but some insurers are working hard to catch-up! And while we're getting ready to announce our "Best Insurance App" finalists on the 11th September, we thought we'd share our Smart Money People long list with you. Enjoy! What we loved: slick on-boarding and ease of use, within a visually appealing app. Could be better: we really liked Cuvva, and any issues are largely product related, e.g. (excesses can be high, not everyone can get insured, among a couple of other niggles). Aviva are one of the big insurance companies who are just doing apps “right”. In their take on telematics, Aviva Drive, they’ve added a lovely amount of polish, all of the functionality you’d expect, and made it incredibly easy to use. In this respect, many apps from other large car insurance companies have a long way to catch up, so Aviva should be applauded for their efforts and investment into their apps (we also like the simplicity of MyAviva’s “all your policies in one place”). What we loved: it’s one of the best looking insurance apps, married with useful functionality, and uses gamification in a fun way to encourage safer driving. Could be better: telematics functionality via mobile phones still has some gaps - dropped signals could mean imperfect data which annoys customers and defeats the purpose of the system, some of the ‘gamification’ (read: marketing) aspects - sharing driving trips on social media, rewarding the user for posting reviews, are corny rather than impressive. Social insurance by So-Sure rewards users by giving them up to 80% of their annual policy back if they don’t make a claim. That is provided they have some friends who also have So-Sure policies, meaning it’s an innovative concept which lends itself perfectly to an app. Luckily the app does the job, and keeps the user engaged in a very smart social media-like way. Add “connections” and be rewarded - it’s Facebook, but for insurance. What we loved: quotes can be obtained incredibly fast, and the app reflects just how far away from an 'old-school' policy document So-Sure is. They’ve taken what can be a relatively dry subject, and by adding elements of social media, keep it engaging. Could be better: because discounts are highly dependent on gathering additional friends, the price, and the push to attract more friends to sign-up could be off-putting for a lonely So-Sure user! With backing from general insurance giant Ageas, Back Me Up became infamous for announcing that it was “only insuring millennials” when it launched. So it makes complete sense that Back Me Up’s insurance app game is strong - with a simple to use app (that looks vaguely Twitter-esque). It’s a trend among several of these apps - lots of white space, calming blue, friendly visuals, and easy on-boarding. Again, we see gamification used to keep the user engaged, and wanting to “score” more. What we loved: in a world were insurance company T&Cs can feel like much less magical chapters from The Lord of the Rings, and ID verification can require photocopies and the good old postal system, Back Me Up couldn’t be much cleaner to look at, and simple to use - it just "does what it says on the tin”. There’s also “levels” within the app, rewarding users for helping others, and just using the app. Could be better: some of the app is just a website wrapper, or directs the user straight to the Back Me Up website (i.e. the “community”) which is slightly disappointing, and while others have AI/live chat within the app, here we’re constrained to a forum - which isn't very 21st century. Trov provides “on demand insurance for your things”. As with others on this list, Trov makes no bones about targeting millennials (Trov is infamously the “Tindr of insurance”). And with this target segment, the look and feel of the app (and it's ability of get the job done) is critical. Trov does the job! With a clean interface, and insurance for common gadgets and household items which can be turned on or off in one tap. The data entry requirements are minimal, so no lengthy forms, and no long term contracts. It’s ideal for those living “now” and the flexibility of the app reflects that beautifully. What we loved: the concept and the app work together to make insurance more appealing and simpler to understand. One example is that during the first sign-up, Trov even auto-selects and offers to insure the device you sign up on. In an industry full of jargon, acronyms, and let's face it, a bit of an image problem, getting insurance from Trov couldn’t be much more straightforward. Could be better: Trov is a very slick app, and though you can’t insure everything with it just yet - we really wish you could! One common problem users report is having items valued at less than what they perceive to be a fair market value if a claim is required down the line. Exercise and earn rewards with Vitality’s Health app. By baiting the user with cinema tickets, coffees, and even flights abroad, Vitality encourage their users to stay fit by integrating wearable technology - Apple Watch, FitBit, etc. If there’s ever a reason to exercise, free stuff at the end of it (and lower premiums) should be enough to get anyone on the treadmill. The sister app Vitality GP also allows users to connect to a doctor via webcam, and they’re both visually appealing, work as expected, and feel modern, particularly for a very-well established brand like Prudential (who own Vitality). What we loved: it’s difficult to turn down free coffees for exercising, however the app is engaging and encouraging. Innovation is the name of the game, as Vitality is one of the very few insurance companies making the leap into wearables - and doing it well. Could be better: users report inconsistent data, and the feeling that for now, rewards can always be “cheated” - if you can just jiggle your watch around, what's the point? Telematics apps are becoming more and more prevalent, and many of them look identikit, and as though they’ve been created in 2008. woop - aimed at younger drivers is a lot more appealing. In a case of “know your customer” the app is welcoming, and easy to use, so should speak to their target market well...we're a bit older to be really sure though :-) If it’s something you use every single time you drive, you might as well enjoy using it - which is were woop triumphs over some much bigger brands doing the same thing, only not as well. What we loved: fairly modern take on a telematics app, wrapped up in an easy to use package - and thankfully, still restrained on the “young person” angle. Could be better: while the app stands out against well-established rivals, it still doesn't have that level of polish that Cuvva, or Trov above present. Part health assessment, part activity tracker, and part personal trainer, the AXA PPP Proactive Health app encourages users to monitor, take care of, and track fitness levels. By integrating with wearable devices (quite a few are supported) it couldn’t be easier to measure activity levels. Working best alongside companion app MyHealth, policy details and documents can be viewed, and claims can be submitted all without having to leave the app. There’s no “rewards” like with the Vitality app above, with the app focussing on recording activity, rather than rewarding it (for now anyway!). What we loved: health and fitness tracking via wearables is so “now” and coming from one of the most well-known companies in the field gives it a lot of credibility. It's a difficult ask, but making exercise tracking less of a chore and more of a game is a good thing. Could be better: for now, it’s a fringe benefit of having an employer AXA PPP healthcare plan. Which is a shame, as the app could be useful for all of us. There are some privacy concerns around wearables and the data being sent back to your insurer. The question on how much data consumers are prepared to share with third parties and how it's used will become a growing issues in the years to come. AIG has frequent travellers covered with their travel assistance app. The app contains nigh-on everything you’d need when planning and taking a trip abroad - there’s safety advice from the FCO, videos for staying safe while abroad, even a section containing foreign translations of common medications. There’s also easy access to your policy documents, and locations of recommended hospitals and health care providers, as well as the ability to connect directly to a claims advisor, should something go wrong. Handy. What we loved: peace of mind from an app which would be great before (and after) in the event of a claim, and has genuinely useful information to quickly reference when abroad. Could be better: the app still relies on the user’s data connection - it would have been nice to store some data offline which would also save on roaming charges. 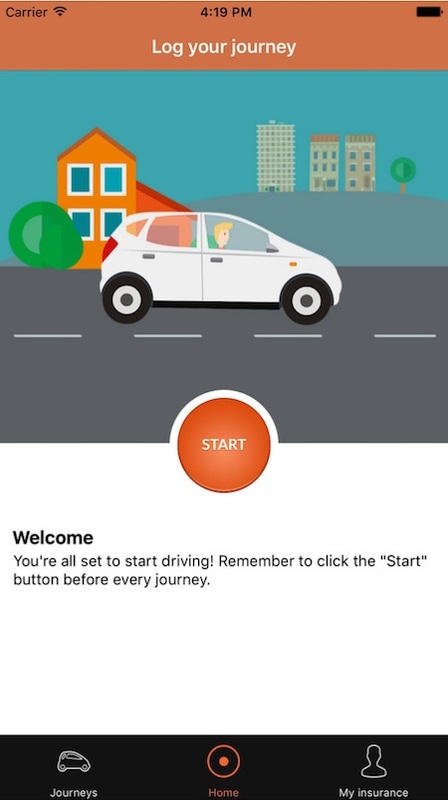 Marmalade are another car insurance provider who offer young, student, and learner drivers the chance to get driving thanks to their telematics app which simply records and stores details of trips they make. As one of the first companies offering telematics, Young Marmalade as it was called back in 2012, kickstarted the telematics revolution by offering iPhone, Android and even Blackberry apps. What we loved: Smart Money People reviewer Anna said: "Marmalade has allowed me to drive my parents car at a great price with no costs to my parents! App easy to use and review journeys. Highly recommend." Could be better: while it's not something we see with many on this list, support for newer tech like Apple's TouchID to login would really take this app into 2017.
Who will win “Best Insurance App 2017”? When it comes to mobile apps, the insurance sector is still playing catch-up with the banking sector. When even the heavyweight banks are fighting hard to catch-up with the likes of Atom Bank, Monzo and Starling in terms of app functionality and innovation, their insurance cousins generally have a poor showing when it comes to the look, feel, and usefulness of their apps. If you’d like to vote for your favourite insurance app, be it a simple telematics app from one of the large car insurance companies, or an innovative startup, please do so today! Your vote could help that company win “Best Insurance App 2017”, and you’ll be entered into our prize draw to win £1000! We will reveal the finalists for "Best Insurance App" on 11th September.